Overview - A thrilling, horror film based on a true story about a single lawyer (Laura Linney), who takes on the church and the state, when she fights for the life of a priest (Tom Wilkinson), who has performeda deadly exorcism on a young woman. Linney must battle the cocky state lawyer (Campbell Scott) as well as her own demons, as she realizes that her career so far has not led her to fulfillment. I think I’m falling in love with Tom Wilkinson. Not enough to leave my wife or reevaluate my outlook on life, mind you, but just enough to add him to my all-too-short list of consistent, dependable actors working in the industry today. Whether portraying a grieving father in the overlooked gem, ‘In the Bedroom,’ a shifty doctor in ‘Eternal Sunshine of the Spotless Mind,’ or a corporate-law crackpot in ‘Michael Clayton,’ the award-winning Brit knows how to steal the show every time he appears on screen. I’d even go so far as to say Wilkinson is one of those rare performers who can elevate the most mundane material and still create an unforgettable character -- one that endures in spite of the film itself. In ‘The Exorcism of Emily Rose,’ Wilkinson plays Father Moore, a priest charged with medical neglect after a young college student named Emily (Jennifer Carpenter) dies while in his care. The cause? According to Moore, Emily was possessed by demonic forces and passed away during a particularly grueling exorcism. While the events leading up to her demise are told through a series of intermittent flashbacks, the brunt of the film actually follows Moore’s State trial. On one side of the courtroom, a hardened, humanistic prosecutor named Ethan Thomas (Campbell Scott) argues that the girl likely suffered from a medical condition and died as a direct result of Moore’s intervention. Opposing his claims is a fierce attorney named Erin Bruner (Laura Linney) who reluctantly takes the case in the hopes that a win would secure a senior partnership with her firm. Despite her disbelief in the spiritual realm, she argues for her client, presents a compelling defense, and stirs up more than she bargained for. Honestly, without it’s talented cast and pitch-perfect performances, ‘The Exorcism of Emily Rose’ would be a complete bore. Wilkinson’s vulnerability and tenacity make him an easy character to root for, regardless of personal beliefs. Even viewers who think demonic possession is the stuff of legend will find themselves converted to Moore’s sympathetic flock. Linney steps up as well, inhabiting her character and deftly balancing Erin’s private hesitancy and courtroom tenacity. She inhabits the center of the film -- in fact, she’s the only person on-screen who earns a genuine character arch. Carpenter also deserves a lot of credit. She doesn’t have much screen time, but her brief scenes are necessary to drive the story forward. If we don’t believe in her turmoil, we can’t possibly care about her priest’s trial. Thankfully, the ‘Dexter’ regular is more than up to the task, offering an empathetic portrayal of Emily that’s only outdone by an unsettling physical performance. 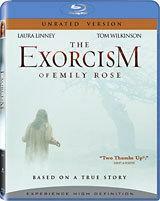 Even so, ‘The Exorcism of Emily Rose’ is a film in which your expectations will directly dictate your enjoyment. Horror junkies looking for deep-rooted scares or intense encounters with the supernatural will be sorely disappointed. Each time director Scott Derrickson (‘Hellraiser: Inferno,’ ‘The Day the Earth Stood Still’) offers genre fans a shocking possession sequence, he immediately offers a rational counterpoint from the prosecutor that undermines the mystery of Emily’s circumstances. As a result, the earliest possession flashbacks are far more effective than later ones -- once you become accustomed to Derrickson’s repeated setups and pulled punches, you begin to relax. After all, it’s tough to be scared of a phenomena -- even when it’s this grotesque and disturbing -- that’s shrugged away with a logical explanation. Granted, the young director eventually makes it clear as to whether evil entities were at work in Emily, but it develops too late in the story to inject any significant dread into the proceedings. Ultimately, ’The Exorcism of Emily Rose’ doesn’t deliver as a horror film, but it does work fairly well as a pseudo-procedural courtroom drama. Despite many critics’ negative marks, I found myself enjoying this twisted morality play more often than not. Could it have been a scream-n-gag thrillride? Sure, but it would have simply revisited material already covered exceptionally well in William Friedkin’s horror classic, ‘The Exorcist.’ While ‘The Exorcism of Emily Rose’ certainly doesn’t reinvent the genre, it at least offers a unique take on its subject matter. In the end, look past your expectations and approach this one as a drama rather than a horror flick. You may be pleasantly surprised. I wouldn’t blame anyone for assuming the 1080p/AVC-encoded transfer featured on ‘The Exorcism of Emily Rose’ would be an underwhelming washout. After all, a bleak palette, ominous shadows, and pale skintones didn’t initially strike me as something to look forward to. However, Sony works its magic once again to deliver a strikingly faithful presentation that doesn’t disappoint. Drab colors may dominate the majority of the film, but the cleanly-contrasted picture boasts deep blacks, revealing delineation, and crisp whites. In fact, the entire image feels more stable, vibrant, and three-dimensional than its mediocre DVD counterpart. I was particularly impressed with how much detail I could see in the shadows at any given moment. I’ll admit that the oppressive tone of the film doesn’t allow many scenes to pop, but the transfer does a fantastic job rendering what could have been a muddy mess. Better still, fine detail has received a dramatic improvement -- take one look at the exorcism climax in the barn and you’ll immediately notice individual pieces of straw, a variety of clothing textures, and the spittle spraying out of Emily’s mouth. It may not paint a pretty picture, but it’s a technically solid example of the best the transfer has to offer. I have a few nitpicks, but nothing that substantially undermines the overall quality of the transfer. Blacks occasionally crush, I caught a bit of leftover edge enhancement, and grain fluctuates from scene to scene. Regardless, fans should be quite be pleased with what they find, ‘The Exorcism of Emily Rose’ has never looked better. The Blu-ray edition of ‘The Exorcism of Emily Rose’ features a commanding Dolby TrueHD 5.1 surround track that nearly lives up to the disc’s impressive video transfer. While the film itself doesn’t offer enough show-stopping possibilities to make this a memorable mix, it still delivers crisp, well-prioritized dialogue, delicate ambient support from the rear speakers, and some much-needed LFE oomph. Sit patiently through the front-heavy courtroom scenes and you’ll be rewarded (albeit briefly) with the source of the track’s true power: the supernatural sequences. Without warning, the soundfield engages the listener from every angle with creepy creaks, chilling howls, and a rumbling score. It quickly becomes clear that Emily’s raspy screams and grasping fingers are only a part of the sonic equation -- during the possession and exorcism scenes I could pinpoint every subtlety in the mix, track movements across the soundfield, and hone in on the slightest details. Unfortunately, these unnerving scenes are few and far between. For the most part, the film is a hushed, contemplative courtroom drama that doesn’t give the TrueHD track much to do. I imagine newcomers will be quite surprised to hear how quiet the majority of the film actually is. Even so, I doubt ‘The Exorcism of Emily Rose’ could sound any better than it does here. Fans should be more than content when they hear the discernible upgrade this lossless track exhibits over the DVD’s muddled Dolby Digital mix. The Blu-ray edition of ‘The Exorcism of Emily Rose’ includes all of the special features that appeared on the Unrated DVD released in 2005. Unfortunately, while the anemic package still delivers plenty of information, the video content is presented in standard definition. Audio Commentary -- Director Scott Derrickson delivers a dry but informative chat about the project’s origins, the film’s cast, the on-set atmosphere, and his thoughts on the final product. He reveals the differences between the theatrical and unrated cuts, discusses the alterations made to the true story that inspired the film, and outlines the aesthetic choices he implemented to sell his glimpses of the supernatural. It’s certainly not an exciting track, but the intelligence and candid attitude Derrickson brings to the table makes this an engaging and beneficial commentary. Genesis of the Story (SD, 20 minutes) -- The most interesting featurette is also the disc’s most frustrating one. Even though ‘Exorcism of Emily Rose’ is based on a true story, very little coverage is given to the actual events. Derrickson discusses how he developed the screenplay and the changes made to make the events more cinematic. While I would have preferred an in-depth investigation into Anneliese Michel (the real life inspiration for Emily Rose), the controversial German court case, and the two priests subsequently convicted of manslaughter, I suppose this straight-forward production featurette at least accomplishes what it sets out to do. Casting the Film (SD, 12 minutes) – For someone whose character only serves as a catalyst for more intriguing performances, Jennifer Carpenter gets a lot of attention in this all-too-brief featurette. Nevertheless, Derrickson explains why everyone from Wilkinson to Linney were the ideal actors for their individual roles. Visual Design (SD, 19 minutes) – Remember when CG didn’t rule the land, practical effects were king, and puppets were a legitimate special effects tool? Apparently, Derrickson did. This fun featurette explores the costumes, makeup, and effects work used to bring the possession scenes to life. Sure, the material isn’t revolutionary, but it’s a solid mini-doc for fans of the film. Deleted Scene (SD, 3 minutes) – The lone deletion included on the disc involves an aimless subplot involving Laura Linney’s character and a bar patron. It adds little to the film and would have merely slowed everything down. ’The Exorcism of Emily Rose’ may be too intellectual for its own good and too scattershot to induce many genuine scares, but it’s still a fine performance piece that succeeds in examining its subject matter from a unique perspective. Fans of the film will be pleased to see how well the Unrated cut has made the transition to Blu-ray. This disc features an excellent video transfer, a solid TrueHD lossless audio track, and a decent smattering of supplements. While I can’t wholeheartedly recommend this release, it does offer fans enough of an upgrade from the DVD to make it worth a look.